A friend I met douban.com, Orpheus, told me once that the New Yorker magazine used to be so good that “you can read it from cover to cover like a book.”. I didn’t really understand what he meant till recently. Starting with January 8th issue this year, one was treated to the pleasure of reading heavy weight authors like Milan Kundera writing a small and light piece on author’s identity (guess that doesn’t sound too light. But comparing to Kundera’s other writing, this little piece that titled “Die Weltliteratur” is light heated), and popular authors like Malcolm Gladwell. You have fascinating topics ranging from Enron’s “Open Secrets” to Tan Dun’s Opera at the Met: “The Last Emperor”, from The Origami Lab, to three Mexican fishermen surviving 9 months on the high sea in a small panga, from the motivation of popular TV series’ 24’s creator to a drastically different perspective from the main stream media on the HP chairwoman spying on her boardmembers. Each article is so different from the one before, yet the topic and writing remains alluring, I couldn’t put it down. By the time I finished reading one issue, I often have the same sensation that i would have after finished reading a good book: happy contentment and slight regret due to the end of a pleasant reading experience. The most recent issue is a The New Yorker’s Anniversary Issue, a double feature (Feb. 19th and 26th), too. This season’s 24 has been so bad, that I stopped watching it. I liked it when i watched the first season on dvd. The cleverness of showing multiple thread on split screen, the intensity of each episode really gets viewer hooked easily. But after the first season, things started to deteriorate. It was slowly turning into the originally interesting and later turned disgusting reality show, Fear Factor. Instead of having participant eating more and more disgusting bugs, viewers are treated to more and more gruesome torture and screaming and bloody scenes. Reading this New Yorker article makes me feel betrayed and a slight relief at the same time. Betrayed cuz I didn’t realize it was a show to re-enforce the Administration’s point of view. A slight relief because I don’t like the show anymore anyways. This is a fascinating article. I didn’t realize that a professional Origami artist(well, actually i didn’t even realize you can be an arigami ARTIST, neither) could earn a decent living, provided you are really really good. Apparently math, high-tech laser beams, and computer software are all needed for top Origami artist. In Japan, the â€œSurvivorâ€-style show â€œTV Championâ€ has often featured contestants engaging in extreme origamiâ€”folding with their hands in a box, or while balanced on stools with the paper suspended above them, or while snorkelling in a fishtank. Lang kept folding while earning a masterâ€™s in electrical engineering at Stanford and a Ph.D. in applied physics at Caltech. As he worked on his dissertationâ€”â€œSemiconductor Lasers: New Geometries and Spectral Propertiesâ€â€”he designed an origami hermit crab, a mouse in a mousetrap, an ant, a skunk, and more than fifty other pieces. They were dense and crisp and precise but also full of character: his mouse conveys something fundamentally mouse-ish, his ant has an essential ant-ness. His insects were especially beautiful. Don’t you wish there is a photo of this great master Lang’s work? 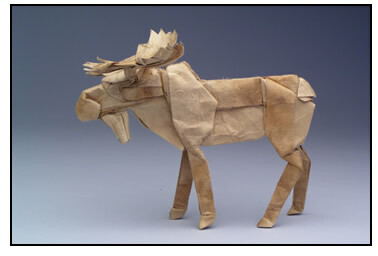 Certainly Google could come to the rescue, Robert J. Lang Origami Gallery, but since i was reading a paper issue New Yorker, I wished there were some color photos to show me the “mouse-ish” , “Ant-ness”, and many beautiful insects. I like his mammals better than his insects. – “The Castaways” – A Pacific odyseey, by Mark Singer. About three Mexican fishermen went out fishing and ran out fuel accidentally, and managed to survive on rain water, fish and sea bird for nine months while floating in their little fiberglass panga on the pacific. Eventually rescued by a Taiwanese fishing boat. It happened from Nov. 2005-Aug. 2006. What i found interesting was that at the beginning of their ordeal, they thought of the movie Castaway and the tv series Lost. But as time progresses they realized they have far exceeded any popular media had ever depicted in terms of survival skills. Another perspective on HP’s “chairwoman spying on board members” scandal. Similar to the article on Joel Surnow and 24, this article showed lots of inside politics within the most famous Silicon Valley company, and the power of one man, Tom Perkins; and how he can utilize the power to generate the media storm which produced the story all of us heard at the end and thought that was the truth. On the other hand, it is easier to blame on “old boys club” being evil to women executives. In addition to Patricia Dunn who is portrayed in this article, Carly Fiorina also comes to mine. I remember the day news broke that Carly was fired from HP CEO position, E, a senior company from my company at the time, said, “she was fired because she was a women. If she was a men, everyone would have been cheering her on. ” The fact is that business is business. Politics is fierce at the top, everyone up there is busy making alliance and shift positions to maximize everyone’s gain or to stabilize everyone’s own position. There is really not a place to feign innocence/ignorance and crying being victimized (unless you can capitalize on that victimization like Tom Perkins did). Hilary Clinton seemed to be setting a better example in this aspect. But we shall see what happens in the 2008 election.